The column, The Shanghai study-abroad Journal, will tell you the local lifestyle and apple affairs. I’d like to inform you about the apple situation in Hong Kong since I visited there with my Italian girl friend, whom I became good friends with in Shanghai while we were studying. Hong Kong is the Special Administrative Region of the People’s Republic of China, with a population of 7 million and a land area of about half of Tokyo. 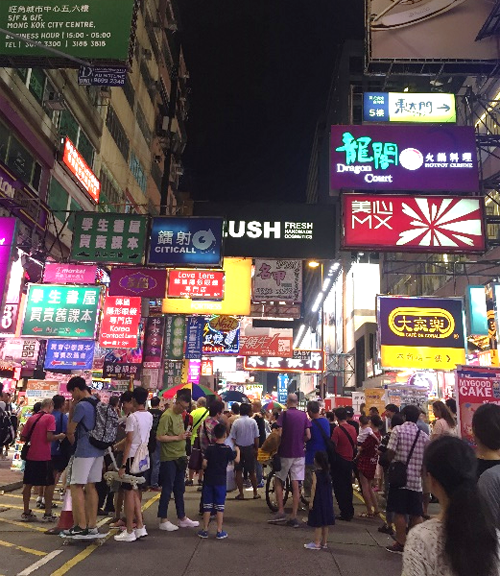 Here you’ll find Hong Kong’s unique flashy billboards and neon signs, multi-tenant buildings and high skyscrapers, etc. It is impressive for its condensed and mixed-up image of a town. The government strived for tourism and trading, so it developed independently financially. It was mid-July,　and the high temperature and humidity made me soaking wet with sweat. Still, you should be cautious in the subway or buildings because of the extra low temperature settings. It is said that more than 90% of Japanese apple exports are from Aomori Prefecture. In 2015 we exported to Taiwan 77% (17,343 tons), Hong Kong 14% (4,460 tons) and China 6% (1,265 tons). The ratio shows the mass exports to Greater China. The amount of exports to Hong Kong has increased in recent years. So I started my search for apples with big expectations. 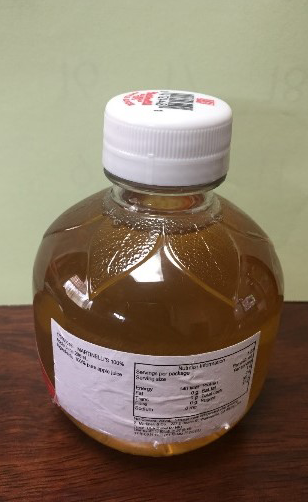 First, in the supermarket of a famous department store, there were neatly packed Fuji, Ourin, Shinano Gold, and Jonagold apples, produced in Aomori. 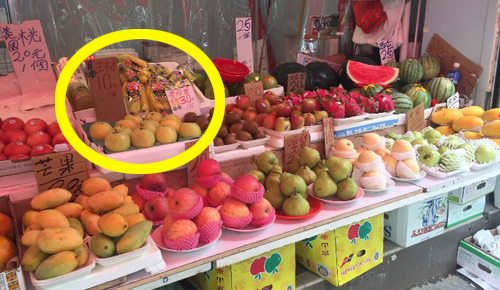 The price for one apple was from HK$29 (small) to HK$34 (big), depending on the size. The selling space in the shop for Aomori apples, red and yellow, was divided into a ratio of 1 to 3. The yellow apples accounted for a large percentage. 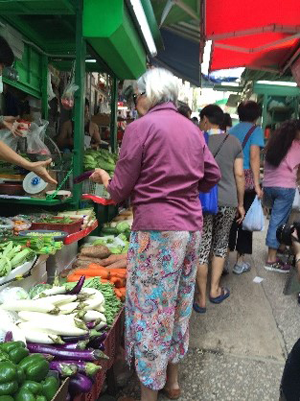 Since there is no border tax, nor a plant quarantine in Hong Kong, there were many red apples from various countries. 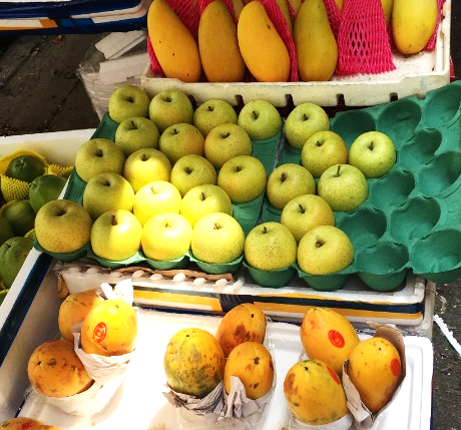 The yellow apples from Japan seemed to be favorable for a change. By the way, the currency here is pretty unique. The monetary unit is HK$. The new HK$10 bills and coins are issued by the Hong Kong government. But the other bills are issued by the three major banks in the city. The color of each face value is consistent for all, but different designs are applied depending on the bank. Just for reference, I’ll report the apple prices of other countries. Although I had the impression that Japanese apples were high-class, Granny Smith apples from France and Pink Lady apples from Chile were both the same size as the Japanese smaller ones and were equally priced, much to my surprise. I also found some apple juice from Aomori at the luxury supermarket. It cost HK$100 to $170 per bottle (\1300~2300). Many other juices from other production areas were on display. 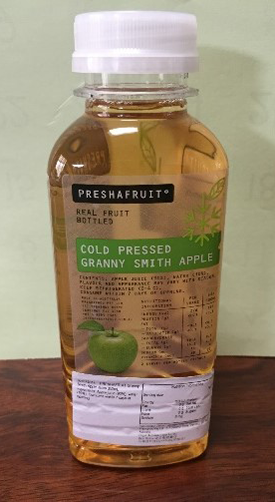 I chose to buy a bottle of Granny Smith apple juice from Australia and another bottle of American apple juice. The former had a strong tart flavor and it reminded me of the taste of cider without soda. And the latter had a strong sweetness. I happened to find Japanese Ourin apples on the street and bought one. (It must have been from Aomori where they use CA refrigerators for long-term storage to supply apples all year. Otherwise it wouldn’t have been marketed in this season.) The fruit flesh was less crispy, but sweet enough to taste. I was happy to hear a direct customer’s compliment and got excited. 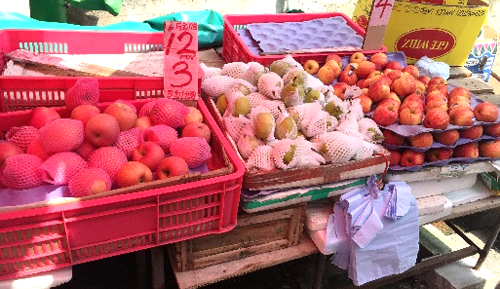 In Shanghai I could only see Japanese apples in high-class or Japanese affiliated supermarkets. But in Hong Kong they were even sold on the streets. It seemed that they were circulated to a wider range of customers. 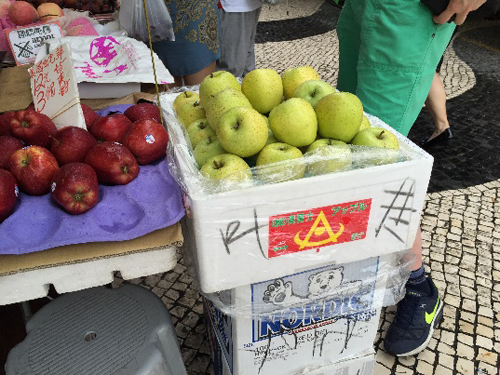 I found Aomori apples in Macau, a former Portuguese colony, as well. I was as glad as if I met a person from my hometown. The price for one was HK$12 (\163). The ones next to it were American Galla. They were HK$12 for three. There was a 3 times difference in price. The currency in Macau is “Macau Pataca.” But HKD is widely accepted in pretty much all businesses, including buses and food stands. As I mentioned before, various merchandise is imported to Hong Kong, a Freeport, from all over the world. It is a promising market; however, it is a highly competitive market as well. I hope that Aomori apples keep their high ranked position. 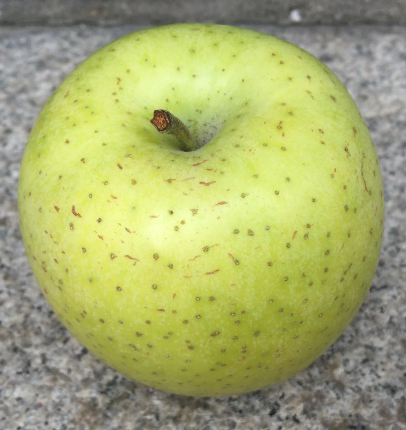 I also feel there is a sign of an increasing presence of Aomori apples in Greater China and South East Asia, which is growing rapidly in recent years. I wish that these delicious homegrown apples could reach many more consumers. The rate is HK$1 = \13.59, as of July 15, 2016.